Remove the drain plug and overflow tube, and then drain the CVT fluid. When draining CVT fluid use safety glasses. Remove the drain plug gasket from the drain plug. ), and then remove the oil pan and oil pan gasket. Remove the magnets from the oil pan. 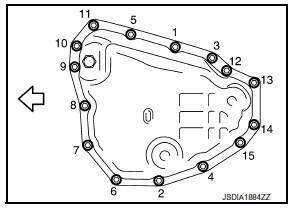 Do not reuse oil pan gasket and drain plug gasket. When installing the oil pan bolts, be sure to use new bolts. Completely remove all moisture, oil and old gasket, etc. from the oil pan gasket surface of transaxle case and oil pan. When installing the overflow tube, be sure to tighten to the specified torque. If it is not tightened to the specified torque, the tube may be damaged. 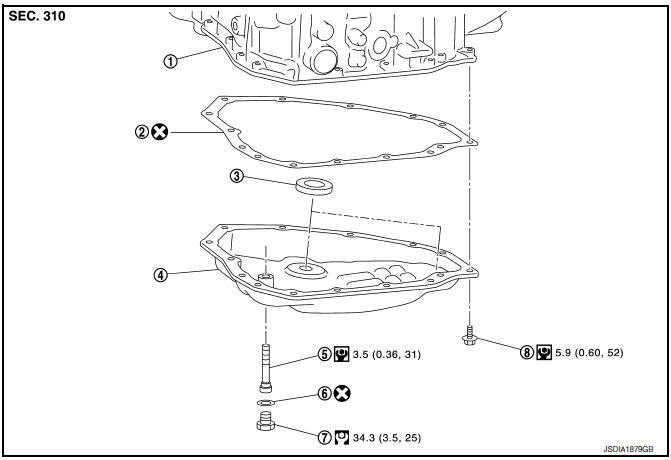 When the oil pan is installed, tighten bolts in the order shown in the figure after temporarily tightening the oil pan bolt. Check oil pan for foreign material. 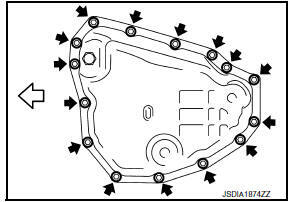 If a large amount of worn material is found, clutch plate may be worn. If iron powder is found, bearings, gears, or clutch plates may be worn. If aluminum powder is found, bushing may be worn, or chips or burrs of aluminum casting parts may enter. Check points where wear is found in all cases.